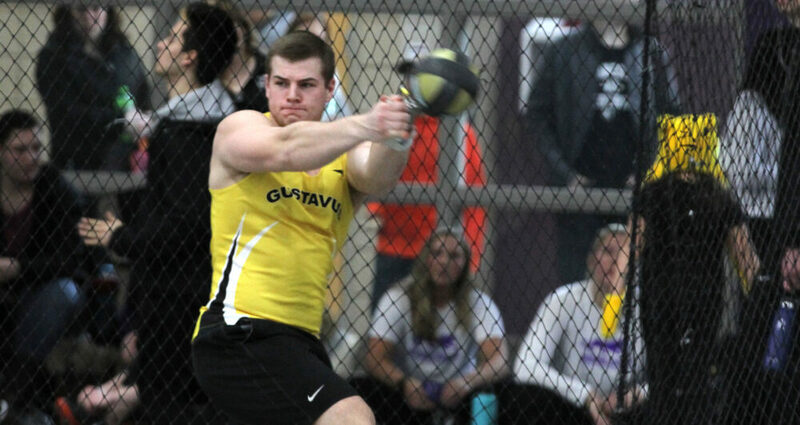 COLLEGEVILLE, Minn. – The Gustavus men’s track & field team competed at the CSB-SJU Indoor Invitational on Saturday and recorded 122 points for second place. Michael Hensch (Sr., North Branch, Minn.) highlighted the meet for the Gusties, winning the weight throw with a McNeely Spectrum record heave of 60-5.25, breaking the previous record by nearly two feet. The mark of 60-5.25 is 12th best in NCAA Division III entering Saturday. The Gusties placed in the top-four in eight different events.